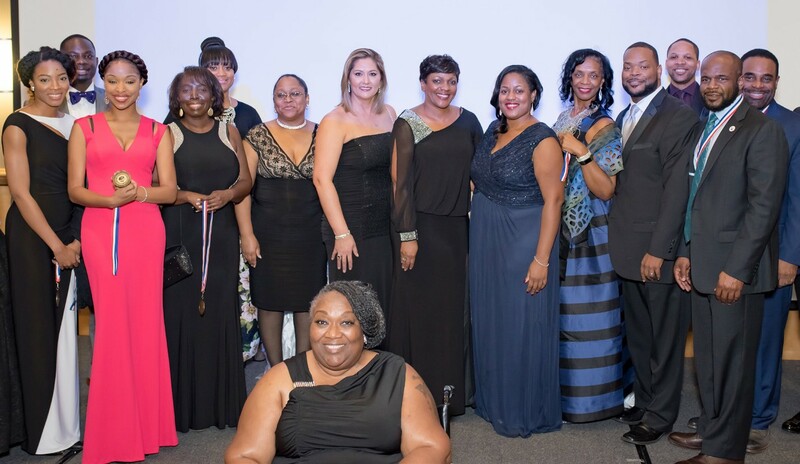 With hundreds in attendance dressed in black tie and formal attire, Urban Savannah Chamber of Commerce, Savannah’s only African American and minority focused chamber celebrated their Inaugural Annual Meeting and Awards Banquet, presented by title sponsor South State Bank. Eula Parker, Senior Vice President for South State Bank, was the Event Chairperson. Among the guests in attendance were Melvin Coleman, Executive Director for the Atlanta Black Chambers, Ms. Ronic West, founder of the Greater Augusta Black Chamber along with her delegation from Augusta, and many others from around the region. Dignitaries in attendance included Alderman Van Johnson, Mayor Pro Tem Carol Bell, and Mayor Eddie DeLoach, who gave a civic greeting during the ceremony. 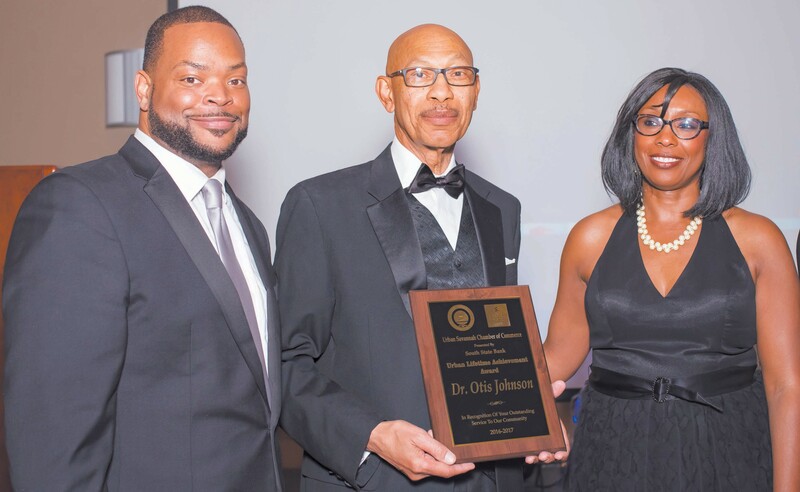 Former Mayor of Savannah Edna Jackson gave a warm and endearing introduction to former Mayor Dr. Otis Johnson, who received the Urban Savannah’s Lifetime Achievement Award. Dr. Johnson gave a speech that empowered the entire room. The evening began with a silent auction and a cocktail hour hosted by Ashia Miller, Miss Georgia United States. Guests enjoyed networking and the musical sounds of steel drum player Melvin Dean of Steel the Show. Tina Tyus Shaw of WSAV served as Mistress of Ceremony. civic, and community stakeholders. It speaks to the volume of influence Urban Savannah Chamber of Commerce has built in the last year. Founder and President John Voner highlighted the accomplishments over the past year with such events as the Small Business Symposium in partnership with the FDIC, and the Economic Summit and Business Expo it hosted with Savannah State University. The organization has grown to nearly 200 members ranging from large corporate partners such as Georgia Power Company to local small businesses such as Mike Holland State Farm Insurance. Voner mentioned that in 2017 they are positioned for exponential growth, and plan to reach five hundred members by the year’s end. Urban Savannah honored Calvin Harris, owner of MOC Candles with the Emerging Leader Award, Dr. Jackie Gilbert-Grant, Founder of Ladies Inc with the Urban Ambassador Award, and Yolandra Shipp, President of AGES Empowerment with Chamber Member of the Year. Among the Businesses, Build A Bridge Foundation received the Community Advocate Award, Indulge Coffee received the Emerging Business of the Year, Wells Fargo Bank was awarded Corporate Partner of the Year, and Business of the Year Award went to Jacky Somesso and the Mediterranean Tavern. Congratulations to all of the winners, nominees, and to Urban Savannah Chamber of Commerce on a successful night. We are anticipating even great things from this organization. To learn more about Urban Savannah Chamber of Commerce and how to join go to their website at www.UrbanSavannah.cc or call 912-417-9610. If you think it impossible to ban country IP’s you are a fool. As for the banning of Kenyan writers, it will happen. You have none but yourself and your fellow wannabe Kenyan writers to blame. Some ESL writers are beyond superb – the Kenyans are not amongst them.